“I met this girl online. A Millennial. From India. Everything looked perfect on paper,” he said to his blonde lunch date. I sat at the counter of the Greek restaurant listening to this. The lunch date had her back to me and sat face-on to this fellow. He was good looking. Chiseled features, straight nose, good teeth. “I knew this was too good to be true. And I was right. She was looking for someone to give her a leg-up in her career. I didn’t want to date a business deal. What are you having for lunch? To drink? The lamb salad is good.” He continued talking. She never uttered a word. The food arrived. She got the chicken salad. She skewered it with a fork. The pumpkins are out. All kinds, shapes and colors. They make me smile. I can’t explain why except maybe it’s the color and the texture that draws me in. Something so ordinary has so many interesting features, like a black and white photograph of an old man with the wrinkles of time carved into his face. It takes 85-125 days, about 4 months, to grow a normal size pumpkin. The mini variety can be grown on a trellis or fence. So even high-rise techie dwellers with a balcony can get into the harvest mood. Who knew? I love to line up the minis down the middle of my dining room table, and they’re pretty on a mantelpiece in a row. But the place for most impact is in a large basket on the living room coffee table next to your blue coffee mug. It must be the color of the sky if your basket is filled with orange pumpkins. Blue and orange are complementary colors and make a good pairing. If you have the time, paint one black and white. That’s always a stunner. In fact black and white patterns elevate any space. Try it. 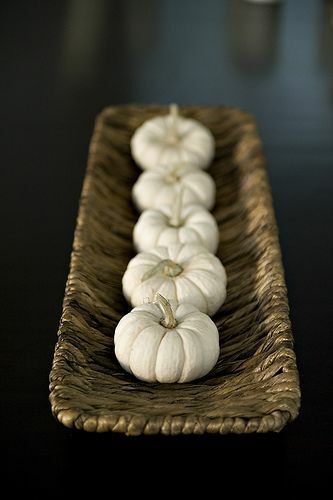 I think I’ll paint my pumpkins this season in polka-dots and stripes and line them up on my driveway. They’ll act as landing lights into my garage when I get home. We are a country of innovators. I passed a driving range where I saw a man in a cart with an automated scooper that picked up all the golf balls lying on the ground. Hundreds of them. They looked like giant hailstones on a fake green turf. And here I thought this guy would be stooping and picking these up by hand. Shows you how another gener ation I am. I marvel at the candy factory machines that cut, coat, and wrap each piece. I’m used to the tortilla making factories of life with one ball of dough being flattened into a round circle and then placed on a conveyor belt and run through a hot oven. This is usually the job of one young girl in threadbare clothes in a village garage. I grew up with people doing the work by hand. But now we have robots making cars and pizza. Who’s going to be making babies in twenty-five years?